Blog / TRON — a place for the future! What do you know about TRON? The TRON project is aimed to create a network for decentralized exchange of content between users on the blockchain, as well as for the development of entertainment and information applications. One of the advantages is that the TRON protocol currently processes more than 1 million transactions and works with 600 thousand wallets. Like other cryptocurrencies, TRON aims to make cheaper global transactions more accessible. Using distributed storage along with blockchain technology, TRON also seeks to create a worldwide free entertainment system. But all technologies have their imperfections. The difficulties of implementation in real life, confusion of wallet addresses, the complexity of programming smart contracts, as well as an unstable and inconvenient test network. To solve such problems, there is MyWish, the multi-chain service for smart contract creation which has been working with progressive blockchains since day one. 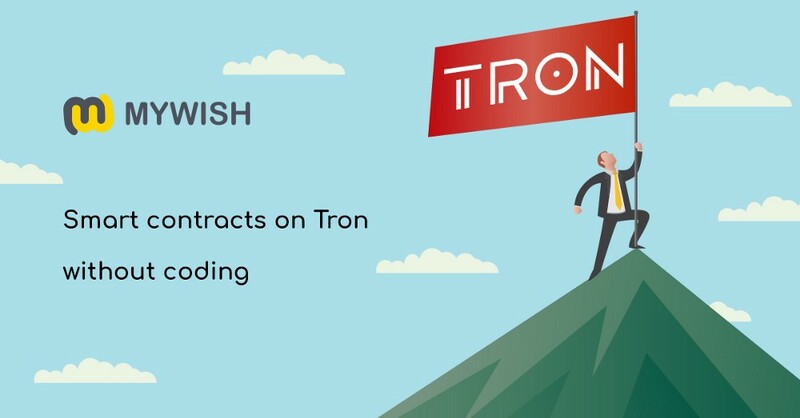 So the MyWish team proudly declares that smart contracts on TRON can be created without programming soon. This will admit connecting the technical infrastructure and the reality at an early date. The MyWish project is a unique idea of integration with different blockchain to create smart contracts with zero coding skills. The main goal of the MyWish development team is to eliminate the gaps between developers and ordinary users & businesses. The first platform that allows everyone to create a token in the TRON blockchain. Prior to this, the MyWish Team enabled ETH, EOS and NEO users to create crypto will, Token, Crowdsale, Airdrop, Lost key and other smart contracts without coding. Since self-respecting developers are interested in the highest quality product, global partnerships and confirmed blockchain programming skills are required. This year several large-scale projects for the crypto community were implemented: MyWish became the first EOS smart contract platform and acted as developers of NEO blockchain. Hence MyWish developers will help people to use TRON on a daily basis because MyWish has repeatedly proved its competence in the crypto market, that devs can implement a new feature and TRON is great as a blockchain for solving a number of business problems. As a first step, we plan to launch TRON Token contract before the new year and participate in the TRON Accelerator contest to win. Other types of smart contracts are also planned, so if you, as the users of TRON, have preferences, we are always open to proposals. Therefore, We ask everyone involved to endorse us. We need marketing support from the TRON Community that is people will find out about the service, where everyone can create their own tokens reliably without programming. In addition, we want to contact the technical developers’ team to work together. And as it turned out to be quite difficult to do, but the development must be useful for both sides. We are going to allow the creation of the Token contract on the TRON blockchain on the 1st of January 2019, stay tuned.